I have a passion for stories about sustainable and conscious living, or people who are generally just doing things their own way and making their mark because of it. There is nothing more fascinating than someone who is choosing to disregard the societal norms and create a life they've always dreamt of, or perhaps create a business that echoes their lifestyle ethos. It's these curious creatives, these dreamers and makers, that really strike my interest. Their stories are the ones that keep me mulling over ideas in the night, and they're the stories that I believe are most worthy of telling. Because we need to hear more stories about people who want to make the world a better place so that we can be inspired to make our own positive changes. Below is a small selection of some of my published articles. Death is an an inevitable final chapter of life, and the way we choose to exit the world has a significant environmental impact. Published in issue 11 of Pip Magazine, 2018. Please note, the full article is unable to be reproduced online due to copyright regulations. With an increasing consumer appetite for vegan leathers, a handful of dedicated innovators are developing animal-free alternatives from the most unlikely of sources. Published in issue 27 of Peppermint Magazine, Autumn 2018. The story of Louise Conlon, also known as Tatu-Lu, and her incredible Aboriginal art tattoos. Written for and published by SBS Life. Written for and published by Brisbane City Council's Live For Less website. An article on minimalism for Brisbane City Council's Live For Less website. Recognise the value of your dollar, consider the alternatives to new, and become a conscious consumer. An article on why you should go a whole month without buying anything new for Brisbane City Council's Live For Less website. 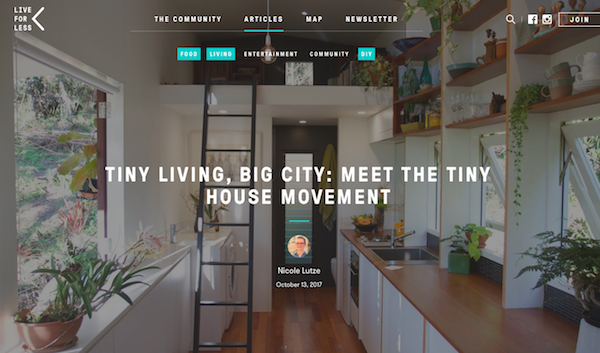 An introduction to the tiny house movement, and a case study on Brisbane's own The Tiny House Company. Written for Brisbane City Council's Live For Less website. 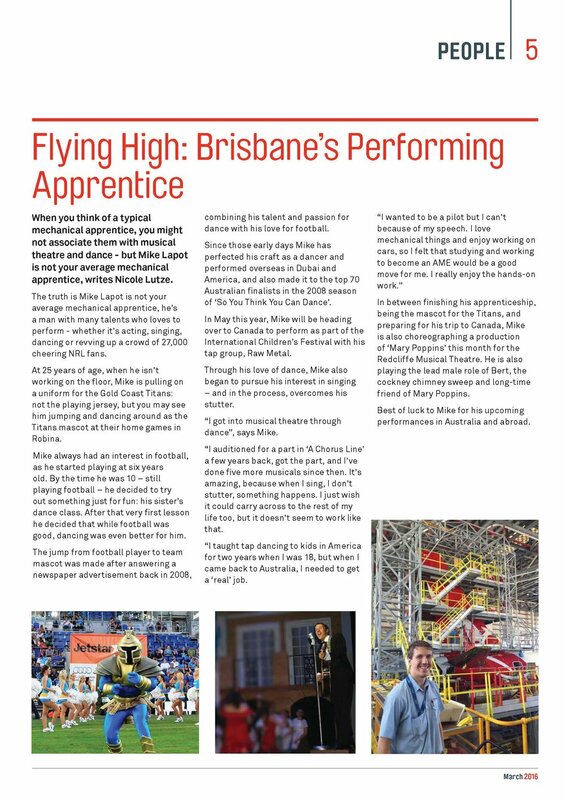 A Qantas aircraft maintenance engineer who also dances and sings in musicals, and revs up a crowd of 27,000 cheering NRL fans in his spare time? Yep, this is the story of Mike Lapot, a musical theatre partaker, Cowboys mascot and aircraft engineer. Written for Qantas Engineering's internal magazine. A behind-the-scenes look into the world of aircraft maintenance, written for Qantas Engineering's internal magazine. For three years I wrote and produced a weekly fashion and shopping page for Quest Community newspapers. The page featured local and national businesses and was usually themed.